China accused the United States of bullying and warned it would hit back after the Trump administration raised the stakes in their trade dispute, threatening 10 percent tariffs on $200 billion of Chinese goods. China's commerce ministry said on Wednesday it was "shocked" and would complain to the World Trade Organisation, but did not immediately say how it would retaliate. In a statement, it called the U.S. actions "completely unacceptable". The foreign ministry described Washington's threats as "typical bullying" and said China needed to counter-attack to protect its interests. "This is a fight between unilateralism and multilateralism, protectionism and free trade, might and rules," foreign ministry spokeswoman Hua Chunying told a regular briefing on Wednesday. Beijing has said it would hit back against Washington's escalating tariff measures, including through "qualitative measures," a threat that U.S. businesses in China fear could mean anything from stepped-up inspections to delays in investment approvals and even consumer boycotts. The Wall Street Journal, citing unnamed Chinese officials, said Beijing was considering steps including holding up licenses for U.S. companies, delaying approvals of mergers involving U.S. firms and stepping up border inspections of American goods. China could also limit visits to the United States by Chinese tourists, a business state media said is worth $115 billion, or shed some of its U.S. Treasury holdings, Iris Pang, Greater China economist at ING in Hong Kong, wrote in a note. On Tuesday, U.S. officials issued a list of thousands of Chinese imports the Trump administration wants to hit with the new tariffs, including hundreds of food products as well as tobacco, chemicals, coal, steel and aluminium, prompting criticism from some U.S. industry groups. It also includes consumer goods ranging from car tires, furniture, wood products, handbags and suitcases, to dog and cat food, baseball gloves, carpets, doors, bicycles, skis, golf bags, toilet paper and beauty products. "For over a year, the Trump administration has patiently urged China to stop its unfair practices, open its market, and engage in true market competition," U.S. Trade Representative Robert Lighthizer said in announcing the proposed tariffs. "Rather than address our legitimate concerns, China has begun to retaliate against U.S. products ... There is no justification for such action," he said in a statement. Last week, Washington imposed 25 percent tariffs on $34 billion of Chinese imports, and Beijing responded immediately with matching tariffs on the same amount of U.S. exports to China. Each side is planning tariffs on a further $16 billion in goods that would bring the totals to $50 billion. Investors fear an escalating Sino-U.S. trade war could hit global growth and damage sentiment. On Wednesday, the MSCI's broadest index of Asia-Pacific shares outside Japan was down about 1 percent, while the main indexes in Hong Kong and Shanghai recovered somewhat after falling more than 2 percent. S&P 500 and Dow futures dropped around 1 percent, pointing to a weak opening on Wall Street later on Wednesday. The onshore yuan tracked its offshore counterpart lower with traders closely watching the key 6.7 per dollar level as pressure mounted on the currency. U.S. President Donald Trump has said he may ultimately impose tariffs on more than $500 billion worth of Chinese goods - roughly the total amount of U.S. imports from China last year. The new list published on Tuesday targets many more consumer goods than those covered under the tariffs imposed last week, raising the direct threat to consumers and retail firms and increasing the stakes for lawmakers in Trump's Republican party facing elections in November. The list is subject to a two-month public comment period before taking effect. Some U.S. business groups and lawmakers from Trump's own Republican Party were critical of the escalating tariffs. Senate Finance Committee Chairman Orrin Hatch said the announcement "appears reckless and is not a targeted approach." The U.S. Chamber of Commerce has supported Trump's domestic tax cuts and efforts to reduce regulation of businesses, but does not back Trump's aggressive tariff policies. "Tariffs are taxes, plain and simple. Imposing taxes on another $200 billion worth of products will raise the costs of every day goods for American families, farmers, ranchers, workers, and job creators. It will also result in retaliatory tariffs, further hurting American workers," a Chamber spokeswoman said. Louis Kuijs, Hong Kong-based Head of Asia Economics at Oxford Economics, said while he expects China to strongly condemn the U.S. moves, its policy response is likely to be limited for now. "In part because they have only limited ammunition and in part because it's still early in the process on the U.S. side," Kuijs said. Trump has been following through on pledges he made during his presidential campaign to get tough on China, which he accuses of unfair trade practices including theft of intellectual property and forced technology transfer that have led to a $375 billion U.S. trade deficit with China. China's exports have mushroomed since it joined the World Trade Organisation in 2001, making it the world's second-largest economy and prompting widening criticism in recent years from trading partners that it has unfairly used global trade rules to its advantage. As its dispute with Washington deepened, Beijing has been calling on other countries to support global free trade and has talked up efforts to ease investment rules. During a visit to Germany this week by Chinese Premier Li Keqiang, the countries signed business deals worth more than $23 billion. "China stands in line with the international community on the correct side of history to together protect the rules of the multilateral trade order," foreign ministry spokeswoman Hua said on Wednesday. 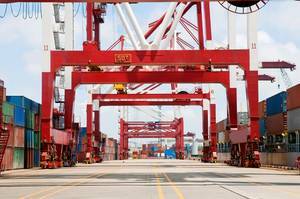 Global ports operator DP World and industrial engineering firm SMS Group announced "Boxbay"